Taken with Olympus E500 digital camera March 17th 2008. Click image for larger view. The Purple Sandpiper (Calidris maritim or Erolia maritima) is a small shorebird (about 22cm) that live on the coast here in Northern Norway. While many birds migrate to warmer climate during the winter this bird stay here throughout the winter. 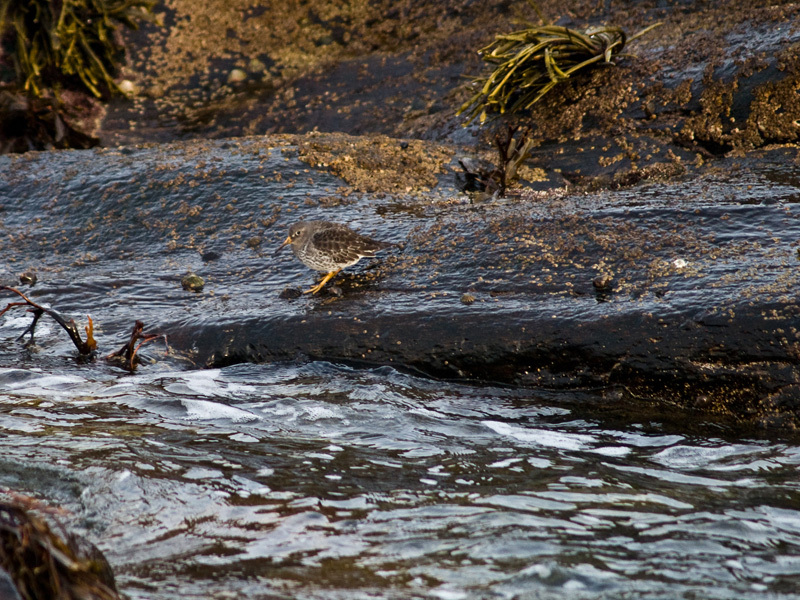 The Purple Sandpiper eat mainly eat insects and mollusks, but when I came across this bird it was feeding on some algae on the rocks. The plumage is a great camouflage among all the seaweed and dark rocks. Often I’m not able to spot these birds before they get frightened and take flight. 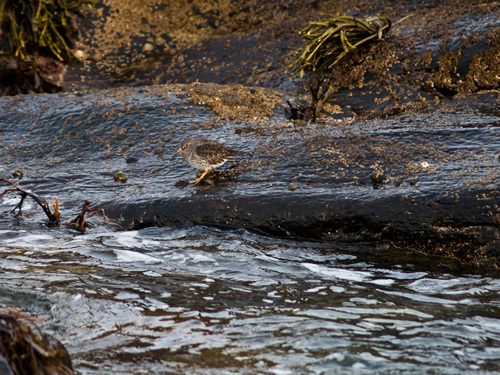 This species is very tame so I was able to get very close with my rowboat to get a picture of the Purple Sandpiper. I still wish I had a lens with better zoom to get an even closer look. Take a look at my picture of a Long-tailed Duck that I photographed last winter. Hello from New York! I love birds. Very nice picture. I can’t wait until I get my new camera next month. I know its a tough bird and your clever being able to capture it. Don’t think we see it in south part of Norway? Nice close shot. I rather like the bird in the water. It is better than the seagull shot because it is closer up and much clearer. Water looks freezing! Nice shot.